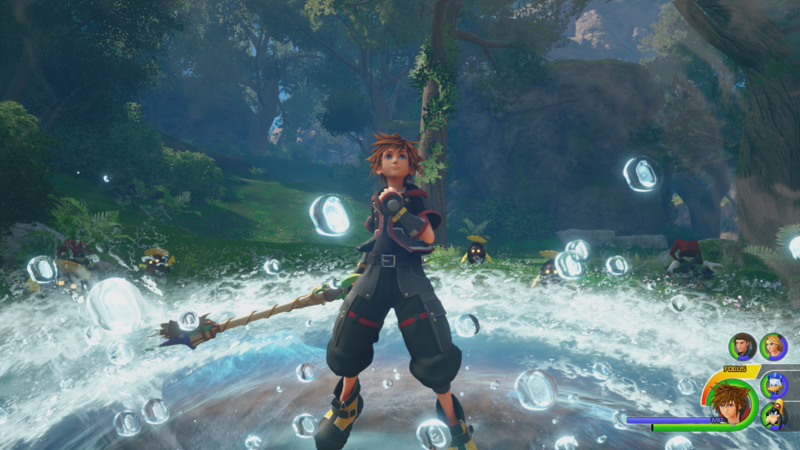 USGamer interviewed KINGDOM HEARTS 3 Co-Director Tai Yasue at GDC 2019 in San Francisco, where they discussed developing the game on Unreal Engine, the refusal to cut content, and maintaining that happiness and positivity the series is known for. In the early stages of development, they began experimenting with Unreal Engine 3, testing all sorts of design concepts that would eventually make their way into the final game. Such examples include the infamous Demon Tower and the flying mechanic utilized in the Pirates of the Caribbean world. The team compiled footage of these tests and showed it off in an in-house presentation session, where it was well-received. The excitement and energy from that initial work carried over when Kingdom Hearts 3's development shifted to Square Enix's own Luminous Studio engine, and then once more to Unreal Engine 4, the latter of which was a decision made by upper management. It's no secret that the multiple engine changes caused much difficulty for the Osaka Team, who were unfamiliar with the tools and had to learn everything from the beginning each time. Thankfully, they could count on the team at Epic Games to lend a helping hand. "We hit a lot of brick walls, but someone was there to help us out," says Yasue. "So I think that's a major thing, connecting to people. It's not just the technology and the engine." One of the highlights of working on the Kingdom Hearts series is how the team would get inspired from the Disney properties featured in the games, creating something new and unfamiliar that would mesh perfectly with those worlds. Yasue describes them as being like kids, dreaming up numerous possibilities. When they were creating the fan-favorite Ever After Keyblade from the Tangled world, they knew they had to incorporate Rapunzel's tower into its design. It wasn't just a weapon; it needed to feature iconic elements that would properly represent the world. The same goes for designing the final boss for the Frozen world. Following discussions with Disney and the Frozen team, they decided to abandon their original castle design and draw inspiration from the film's Nordic roots to create the Sköll, a flying wolf Heartless with the ability to control the sun. The aftermath of a major game's release always includes accusations of cut content. Dutiful fans peer over developer interviews and promotional footage with eagle eyes, trying to find any trace of evidence that differ from the final game. However, it seems they won't find much here, as Yasue struggles to think of any major content that didn't make it into Kingdom Hearts 3. Even when faced with the team's own requests to cut content from the game, Yasue refused to budge. "Everyone was complaining that I should cut more," says Yasue with a boisterous laugh, "but I didn't. I didn't want anyone to cut. There's a lot of discussion about the seven puddings [challenges] for example, they almost got cut. But I wanted that inside the game. I didn't want that added as a DLC. Everyone made the game as we wanted. So yeah, there wasn't a lot of cutting." One of the biggest surprises of Kingdom Hearts 3 occurred in the Keyblade Graveyard, when Ephemera appears before Sora and sends the Keyblades of past wielders to defeat the Demon Tide. Yasue explains that this event was born from the collaboration between the Kingdom Hearts 3 team and the Union X team. They were aiming to accomplish two things: connect with UX players, and surprise KH3 players and changing their impressions of the game mechanics and design. By taking the Situation Command, one of the first mechanics introduced in the game, and turning it up to 300 by lining up equally as many commands with the names of all those UX players in such a manner, they were able to make a big impact. Honestly speaking, there's nothing quite like Kingdom Hearts these days. Whether people like it or not, this series knows exactly what it is, and tries it's hardest to be nothing but the very best version of itself. Despite all of the dreary twists and turns, it's still able to exude that pure, undiluted joy we've felt as children, which is expressed especially well in Sora and the various Disney worlds. I personally really like the happy sort of mood. I think a lot of my coworkers do too. And so we're very happy with that, Sora's positiveness," Yasue tells me. "Another major thing is we're working with Disney obviously, and a lot of their worlds are happy and positive. So I think really, we wanted to take that mood into the game and not make it really dark. There is dark parts to it, but it's very varied, there's a lot of happiness." Read the full interview on USGamer. Someone should ask him about the rest of Twilight Town. So it wasn't really a conscious decision to omit Final Fantasy characters. It's more of wanting to do Pixar, Monsters Inc., Tangled, Frozen." Also this I think throws the whole definition of "cut content" in a grey area. Like, Yasue seems to consider "cut" only something that was made then scrapped, but FF characters were indeed scrapped anyway, no matter how much he insists that it wasn't something they sat down and declared one day. You can't be totally unconcious about not putting FF characters in the game, at some point someone had to notice a Leon model wasn't being made. I'm not gonna mention Nomura constantly saying there wasn't enough time to do this or that even if he wanted to because I think Yasue is mostly talking about himself and what he did or did not I think? Xion, long thought to have disappeared when her heart reunited with Sora's in the events of Kingdom Hearts 358/2 Days, makes her grand return. Honestly speaking, there's nothing quite like Kingdom Hearts these days. Whether people like it or not, this series knows exactly what it is, and tries it's hardest to be nothing but the very best version of itself. Well that's a big "nope" from my corner, lol. See, this is kinda the issue I have with this attitude. "Like it or not, this series knows exactly what it's doing"
You can't... really say that when mine and many other people's major complaint about the game is that it's not doing anything of the sort. And I'm aware it's not the supreme judgement of everything objective but merely a the interviewer expressing their opinion, but this is probably why the debate surrounding KH will always be problematic and difficult. Many people are just disregarding the other side's take entirely. Like I dunno. It's cool to have your own opinion and stuck by them disagreeing with others, I do that all the time, but I'll never say something like" Whether you like it or not, Toy Box is the worst world ever and it does nothing but throwing you unfun Gigas fights." That's not only kinda untrue in many ways, but would completely disregard all the existing people who love that world. You need to at least ADDRESS that there's some people who feel differently than your intended take, and not act like their feelings belong in crazy town. Like with Yasue saying that nothing was really cut from the game: I'm sure many are happy to hear that, but I kinda wish it wasn't true. Knowing KH III is the intended version it should've been doesn't act as a plus in my opinion. So that's exactly how you wanted Twilight Town and Pooh's Book to be? Ok. I can't help but think about the good old days when Miyazaki admitted the whole Izalith section of Dark Souls 1 was rushed and Bed of Chaos was the result of their inability to find a more suitable compromise. The way KH-execs go about it, "Everything's super and we always do our best work everytime" feels a bit jarring to me. As I said elsewhere, sometimes it does seem like they believe no other route than the one they picked was doable. You do realize that line is just fluffy filler from me to pad out the article, right? Obviously not, otherwise I wouldn't have said what I said. Not gonna lie, it's not exactly easy to discern when it was homebrewed here and when it was a line from the USGamer's article. I did have an inkling of a doubt, but I decided to go for it. Oh well, I missed the target but I stand by my shots. Argument still works in a general sense. I liked hearing that the joy in the game was intentional and a focus because I definitely came out of the game feeling it throughout. It was also interesting to learn that they first started with Unreal 3 and not Luminous. I love the positive approach they had to the game. You can definitely feel it in the game and it makes it a joy to play. Regardless of any issues we all have with the game, you can really tell they were trying to make the best game they could make with all of the different limitations and problems they experienced earlier in development. What about the Mysterious Tower gameplay? SURE, NO CUT CONTENT. All original worlds in KH3 are very underwhelming, I can't believe nothing more was cut. Scala ad Caelum in particular. It was intended to be just like that from the very begginning? There was nothing more to it? And no Radiant Garden, no Destiny Islands and a pathetic bit of the Realm of Darkness. In my opinion they could have cut half the Disney content and I wouldn't mind it if the original worlds were at least decent. They only cared about appealing to newcomers and forgot the stablished fanbase who like KH for what is was. And I like the Disney stuff, but when you have a long, overarching and somewhat complex original plot, you have to flesh it out and conclude it properly. Mysterious Tower was likely a test area and never intended to be playable considering the only times we ever saw it were early in development. You know they can’t actually come out and say that they had to cut a bunch of stuff. That isn’t the message or the type of press they want. We can see what Frozen’s world was probably going to be before Disney interfered, we can kinda tell that Riku’s side was probably meant to be extended, that there was likely a lot more planned for the Keyblade Graveyard and Scala ad Caelum, and certainly they probably had a more traditional three act story that had to be refocused due to internal time constraints on development, but it’s nothing we can prove and nothing they’d ever come out and actually say without it being years after the fact. Or...y’know, Nomura being the one to say it. Your complaints are valid, though. I think you're right and it likely was a test area, but they made it look like it was going to be in the game. It looked polished and they showed gameplay. They even released that picture with Sora posing with the Shooting Star keyblade in front of the tower as an homage to FFVII. They released the world logo. It is logical that people wanted that world to appear in the final game (in a playable form, that is) because it was advertised. Did they have to deceive us by showing a location which is not really in the game? I would understand that in a closed event like the one where they showed Scala and other concepts, but not actually promoting it as part of the game as they did. At the very least they could say the truth and recognise they did cut some minor stuff, instead of saying nothing was cut. What upsets me the most is that lie, not the area being or not in the game which is not that important. He didn't say there was absolutely no cutting, he said there wasn't a lot of cutting, that he tried hard to limit the amount of cutting, especially of features (like the flans). And he was also likely speaking in terms of cutting things once their plan was finalized as to what content would be in the game as well (because obviously worlds were cut from the planning and decision stages too). Also, it's not "deceiving you" to show a game in development that changes by the time of release. It'd be deceiving if in the last few trailers the tower was shown with gameplay that isn't possible. It likely was going to be playable at the start, but then they realized that a single patch of grass in front of Yen Sid's tower isn't necessary to play through and they streamlined it by instead having Sora and co go straight to Yen Sid in cutscenes instead of "travel to world, land in world, battle some enemies, enter the tower, yen sid cutscene". It's about trimming unnecessary filler. Personally, not having that area really shown much gives the Ven/Aqua scene there more weight and feel more special when you see the world through their eyes and we finally get a really good glimpse of the sky. At the very least they could say the truth and recognise they did cut some minor stuff, instead of saying nothing was cut. What upsets me the most is that lie, not the area being or not in the game which is not that important. This is literally what he said. "So yeah, there wasn't a lot of cutting" which means they did cut some stuff (which is obvious). The only footage of Mysterious Tower gameplay was originally shown off in a behind-closed-doors event (D23 Japan 2015), and then they just tossed it at the end of a 2016 Jump Festa trailer for 2.8. I get that you're upset and disappointed but they're not doing anything malicious or intentionally trying to wrong you. They're doing the work they want to do, and making human mistakes in the process. It's certainly possible there were major cuts made that he was unable to recall in that moment, but at the end of the day, we're not owed anything. About mysterious tower: If it really was just the tower and only used for cutscenes than honestly it was probably better that they have taken it out of the game. Could you imagine how frustrating it would become to just have to visit this "world" for the tower cutscene which would mean that you have a loading screen when you land. A loading screen when you go into the tower and maybe one when you go into Yen Sids room. And that every single time you have to visit it to hear Yen Sid speek. So, and I try to say this in the least confrontational tone possible, where do these claims that Yasue has to struggle to even think of some major cut content stand after all these hack videos of the leftover explorable space in worlds, especially after the latest video about Scala ad Caelum? At this point I'm not sure this qualifies as "minor". I read somewhere that you need certain assets to show the world. So even if its just in the background never to be used directly it needs to be here to show us the object. But most of the time its just low quality if you would go near it. Thats for example the case with the village of frozens world. Scala is honestly just mostly copy pasted houses and there to look pretty in the distant. As soon as he got near the other island there, you could see that a lot of details were missing and it was kinda ugly. Nothing compared to the part that was playable. Tbh, in that Scala video nothing really showed me anything that was cut content. The world looked like trash the further they went away from the main zone, showing that it wasn’t intended to be seen up close, and it’s all just a bunch of reused assets to make the world. What part of it screamed “cut content”? The most I imagine is that the map we fight in was meant to be more explorable without combat and then it would change into being a battle zone, but they were strapped for time so they just made the map a battle zone immediately.